With financial support from HIVOS, Open Society Initiative and SAAF who have been partnering with Center for Health Human Rights and Development(CEHURD) for a good time now, a health camp was visualised between 12th to 16th October 2015, in Buikwe District considering it has one of the highest rates of people living with HIV from a research done by CEHURD in 2014,especially due to the presence of most at risk populations staying in the landing sites of Buikwe. The Health Camp that initially targeted about 2000 people instead more than tripled this number, in the second annual health camp held this year(2015) at Najja sub county headquarter. During the earlier planning meetings for this great event, the role of partnership was seen as key hence bringing partners like; crown beverages, on board who pledged and offered free tents, chairs and partial sponsorship of drinks for the masses who attended the health camp to get free services, other partners such as; Kawolo hospital, Ebenezer optical centre, Reproductive Health Uganda, St.Francis Hospital Mbiko, Nakasero Blood bank, Marie stopes,Kisiimba Muslim mission, Ziiwa memorial, St.Charles Lwanga among other partners were equally brought on board to provide a range of services from; HIV testing and counselling, Cervical and breast cancer treatment, dental checkups and treatment, oral health care and sensitisation talks, optical checkups and treatment, managing and testing non communicable diseases such as; diabetes, high blood pressure, family planning services andminor surgeries, sexual reproductive health sensitisations, Malaria testing, health legal aid services and free consultations, drama sensitisation, managing and testing STIs among other health related issues and conditions, free of charge. The health camp that lasted a week, was publicised on both mainstream and social media with the trending social media harsh tag for the health camp being: #HealthCamp2015 that got over 10,000 twitter reviews. Different health consultants and specialists such as Dr.Susan Akello from Reproductive health Uganda, Dr.Kiggundu from Mulago Hospital, among others took to the microphone to educate the masses about the different health challenges and how to manage them , CEHURD provided a legal aid tent manned by Mr.Nsereko a legal and programme officer with CEHURD, to educate the masses on the legal issues and how to manage them especially health rights. “aye banha, CEHURD Kyaakooze! (sic) directly translated as ‘My friends, what CEHURD has done for us!” exclaimed 30year old Kalembe Zaujja who came all the way from lugazi to seek support to stop her from giving birth after having 12 children, she feels has had already too many for her besides this situation being financially constraining. Ms. Zaujja’s last born is 1year old and was worried if she did not do anything about the rate at which she is reproducing, things may get out of hand as this is already a burden to her and her husband. When she heard about the health camp, she took her chance to seek help and indeed an operation was done by Dr.Doctor Susan Akello who carried out a permanent procedure known as the bilateral tubal ligation which stops women from giving birth permanently. Zaujja like other locals from Eastern Uganda at the health camp, travelled distances and therefore woke up as early as 5:00am to trek through the dusty and cold roads leading to the venue as this was considered a once in a life time opportunity they had heard about and needed to use up. 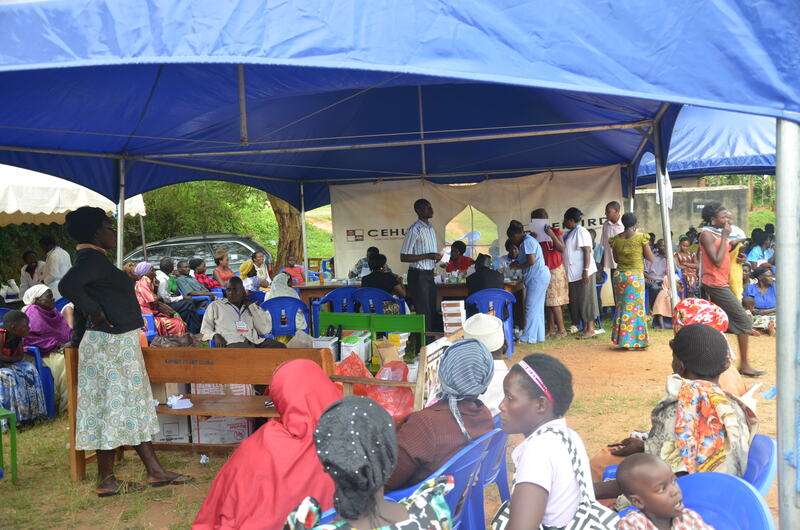 This year’s health camp was building from last years’ health camp held in August 2014, which attracted over 5000 people in the community who received free comprehensive health services. The purpose of this health camp is to bridge the gap between service provision organisations and the work of advocacy organisations which target similar communities.